Just about everyone everywhere in the world has heard of the Kindle e-reader from Amazon which pretty much defined the market when it was first released and which quickly and rightly dominated. There have been a number of increasingly better versions released since then and the latest iteration is the extraordinary Kindle Paperwhite which may well be the best thing since sliced bread (but thinner!). It also provides some very useful features for language learners and education usage in general which this in-depth Kindle Paperwhite review will cover. Update #2- there is now an ALL NEW and better model of the Paperwhite which you can pre-order now – this one includes even more handy features for language learners such as automatic vocabulary building flashcards! Our rating of the Paperwhite has now been bumped up to 4.9 due to the great features in this new version – and despite being better it still costs the same as the old one! wicked battery life – up to 8 weeks! vocabulary builder (flashcards) – NEW! Kindle e-readers are a marvel of technology and are the closest thing to a real book as you can get, with the added advantage of being able to hold up to 1100 books at a time – imagine trying to carry that many real printed paper books!! Even just having that many books at home on shelves is going to be a challenge and with the Kindle you can fit them all in just one hand. Brilliant. Charging is a simple matter done via a USB cable which you can connect to your PC and takes about 4 hours to complete – not bad considering it will last up to 8 weeks. However, while Amazon touts that 8 weeks figure, which certainly sounds very impressive, that is actually based on just 30 minutes reading per day with wifi off. So in reality that means 8 weeks x 7 days = 56 days and half an hour per day so divide by 2 which equals 28 hours of actual usage. That is still quite impressive and several times longer than most notebooks, netbooks or even tablets. If you were a really heavy reader, using it for 4 or 5 solid hours per day, it would still last you about a week and that should be enough for anyone! The Kindle also comes with what Amazon calls an “experimental browser” with which you can actually browse the web. Needless to say, since the screen is monochrome you wont get the full multimedia web experience on this Kindle but for a quick web search, Wikipedia research or even checking email (webmail), it does the job admirably. Note that the “Free 3G” version is limited – you can’t go downloading movies or doing general web stuff over 3G, Amazon are not suckers, you’ll have to use WiFi for that. Another handy feature is the ability to borrow books from a local library (in the US) – for this you will actually need a valid library card as one would expect but other than that, borrowing is a breeze. While the Kindle is designed to ease the process of buying books from Amazon (and they would sure like you to do that), you don’t actually have to buy books – there are in fact millions of free public domain books you can upload to your Kindle for reading at your leisure. For a language learner the Kindle provides several useful functions – first of all it can happily display all manner of foreign language characters such as chinese, cyrillic and more. Secondly it includes an instant translate feature – you can select a word or a whole block of text and have it automatically translated using Bing. Of course this is computerized translation and wont be perfect and it also depends on having an active net connection, however it can be a very useful tool. Other functions useful for study and research include bookmarks and annotations, sharing (posting to Twitter & Facebook), Wikipedia and dictionary search, and “X-Ray” which allows you to easily see right through a book to all relevant mentions that may interest you. There are two major versions of the Paperwhite available – 3G and WiFi and it’s a tough decision to make. Free 3G is of course fantastic to have, you’re rarely going to be out of range of a 3G network or tower but the 3G version does cost quite a lot more. However these days WiFi is fairly ubiquitous around the world and in many cases you can find free open wifi hotspots to connect to, particularly in or around cafes. Also if you have wifi at home you will always be able to use that and so 3G is somewhat redundant. You could save yourself quite a bit of money by getting the wifi version and in the very worst case you might have to drop into a local coffee shop or bar to logon on occasion. There’s not much extra in the box – just the Kindle Paperwhite and the USB cable for charging. 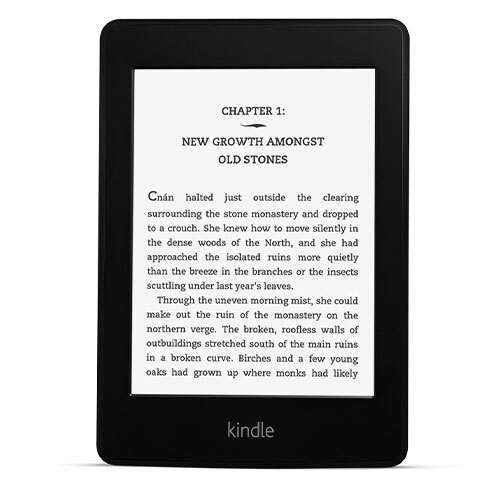 The Kindle is designed to be self-contained and simple to use and the quick start guide (pdf) will have you up and running in no time at all. There are no speakers with the Paperwhite, not even a headphone socket. It is completely without sound capability which on the one hand is a shame, but after all it is for reading books and it is perfect for doing that. If you want to listen to music or distracting beeps you will most likely already have an MP3 player on your mobile phone anyway. If you really want sound and other multimedia functions then the all singing, all dancing Kindle Fire HD is probably the one you need, but that’s a whole different beast. A common complaint from buyers is the appearance of some dark blotches at the bottom of the screen. In fact the issue is simply users who have the light on full when in a dark room which is not the way it should be used – it is not a torch! In a dark room the light should be turned down enough so that it can be read comfortably without causing eye-strain which it would when the light is on full. Under daylight conditions those dark sports are not visible at all. The issue is in fact explained by Amazon (complete with example photographs) here. “With Special Offers” – there are two prices now and to get the lower price you have to accept adverts displayed on your kindle. Some people may object to this but you can choose to pay $20 more to get a kindle with no adverts and if you are outside the US you have to get the ad-free version anyway. Even on the ad-supported version the adverts only show on the screen saver and at the bottom of the home screen so they don’t actually interrupt reading at all. Basically you have a choice and it is not a big deal either way. There are hundreds more like that. The Kindle is an Amazon product and so Amazon is the place to get it – but demand is high and supplies are limited at the moment so order now if you want to get one (or currently two at the most) of these wonderfully useful devices in time for Christmas.